This week, a Sumi painting by Susan Morrisson was added to the walls of the ESUC Library. The painting, donated by members of her Goals Group, Ann Carden, Carla Hellekson, and friend, Barbara Van Dyke Shuman, is a beautiful reminder of the gifts Susan gave to East Shore. Susan, passed away peacefully on February 21st, surrounded by family. She had been a member of East Shore since 1992, and in 2015-2016 served as the Minister of Pastoral Care. She was active with the Earth & Social Justice Council, Women Helping Women, Earth Based Celebrations, and was a pillar in her Goals Group. She also represented East Shore in the community in several interfaith groups. We saw Susan’s love of nature in so many ways, but something special happened for me when I went to the library a few weeks ago, before her death, and studied her Sumi paintings there. 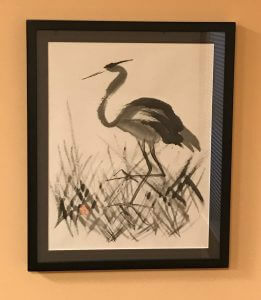 I started observing each brush stroke – where it started and how the flow of ink or paint began and spread out, and how intentionally it was drawn to evoke the beauty and essence of a grass, or bird feather, or beak, or leg, or bamboo stalk. I tried to enter her mind and see how the painting took shape for her, and I felt her love of nature in a whole new way. She was a creator, not just an observer. She entered the natural creative process. She brought to life the spirit of these birds and grasses and trees – and they felt so alive and individual, and she was so alive in them. Sumi painters “appreciate every aspect of nature and enjoy each natural process. They seek harmony with the universe through communion with all things. . . .If one looks at these paintings at leisure with thought and open heart, their inner significance will slowly become apparent.” I think that as we look at Susan’s paintings, we will continue to feel her living creating spirit in connection with all that is.